“What is that?” I blurt out as I stare up at the ceiling of my best friend Wesley’s dorm room. It is the first time I’m in his room, and I can’t stop looking at it. Wrapped around the exposed water pipe above his bed is a gray tablecloth. It is tied tightly to the pipe with red ribbons. Wesley shrugs at me as if to say he doesn’t know. I eventually stop pestering him about it, but I know something is up. Table cloths don’t magically wrap themselves around water pipes. 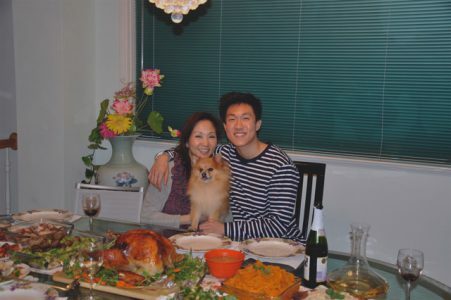 It would take a couple of months and a few encounters with Wesley’s mom, Choi (or Christine as she goes by in America), before I solved the water pipe mystery. Choi Yu, the oldest of seven children, was born in Hong Kong. There, she grew up in a one-room apartment with her parents and six siblings. She excelled at school and set her heart on going to school in America. More than forty of Yu’s family and friends—none of whom had ever been on an airplane—came to the airport in Hong Kong to send Yu off to America. They all gave her gifts, not realizing she could not bring them with her onto the plane. Arriving in Los Angeles, Yu spent a short time at a local community college before attending the University of Illinois. Life in America was nothing like Yu expected. Yu worked multiple odd jobs and existed on a diet consisting mostly of saltine crackers. Perhaps Yu’s biggest struggle in America was learning to speak English. Though she spoke the best English of all her friends back in Hong Kong, she had nothing but trouble communicating in America. This, however, was nothing a few years of English language classes couldn’t fix. By the time I met Yu, her English was almost perfect. Having achieved her dream of attending college in America and later working in real estate for a couple of years, Yu moved on to a more ambitious task. She saved up enough money to bring all six of her siblings to America. It was this loyalty to her family that struck me the most when I met her for the first time. Almost every Sunday evening of the school year last year, I visited Wesley in his dorm room, and there she’d be after making the hour drive to Northwestern University from Chicago where she lives. She brought Wesley food, changed his bed sheets and even brought the family dog, Dexter. Many of Wesley’s other friends thought Yu was “babying” Wesley. I thought so too . . . until Wesley explained to me that this is just what Chinese mothers do. In Chinese culture, strong motherly and familial bonds are valued more strongly than in other cultures. Wesley could change his own bed sheets or pick up his own food, but his mom was just doing for Wesley what had been done for her and what had been done for so many children in her family before. It was at this point that I wondered if Yu had anything to do with the tablecloth on Wesley’s water pipe. 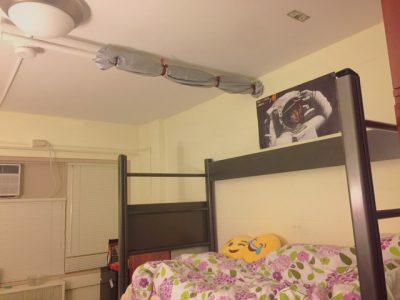 As I learned from Wesley later on in the school year, Yu walked into her son’s dorm on the day he moved in, saw a water pipe hanging over his bed and jumped into action. According to the ancient Chinese philosophical system of Feng Shui, pipes (or anything, really) hanging over a bed bring bad luck and injuries. Yu had wanted Wesley to switch rooms but soon learned that every room in the building had a water pipe above the bed. She eventually settled for wrapping the pipe in an old tablecloth. I admit it. I initially thought the tablecloth on the pipe was pretty bizarre, but I soon realized there was nothing weird about it at all. In fact, it was pretty cool. 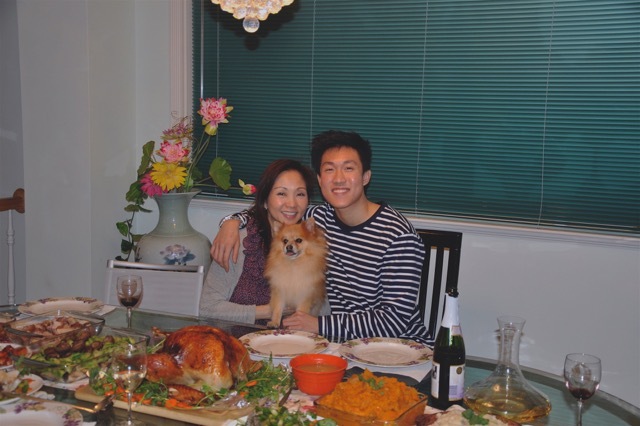 It was just one of the small ways Yu could bridge her current life in America with the life she left behind in China—a pipeline to her Chinese past.